A sweatshirt as a race shirt - very nice touch! Do you know what I like about racing in the fall? Everything. What could be better than a cool, clear morning, sunny skies and no humidity in the air? Answer: all that plus trees with leaves turning from green to gold. That was how I felt as I walked toward the registration area off East Main Street in Oyster Bay this morning, just prior to today's race. I don't do too many 5K races. I actually prefer to compete in 10K's because I like the strategic balancing of speed and stamina over 6.2 miles. But 5K's can be a lot of fun because they allow you to push harder without having to worry about having enough left by the end. Today's race worried me a little because I knew that the first 1.4 miles were mostly uphill. I trained for that and actually looked forward to the challenge, but I'd never run this course and I really didn't know what to expect. Registration was a snap, people were well organized and the volunteers were very kind and gracious. 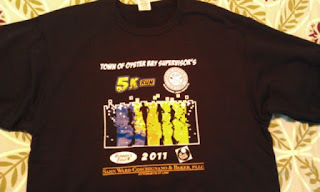 The woman who handed me my race shirt - a nice quality sweatshirt actually - wished me good luck and I knew that she meant it. The acid test for any race is how well they plan for pre-race requirements (Porto-Poti's). There were a number of them available, which kept the lines short, even as we got close to start time. I headed to the line about ten minutes before the 9:00 AM start and ran through some dynamic stretches. The crowd was thickening and I thought I had positioned myself fairly well towards the front. Looking behind me, I saw that I was more than 3/4 of the way toward the back. I figured I'd either pass people to gain position or I wouldn't. Based on results I think I probably passed a quarter of those ahead of me, by the end. It took me 12 seconds to cross the start line after the gun and, unfortunately, there was no starting line sensor to record those of us who lined up farther to the back. If there was a sensor, I would have recorded a time of 26:40 for an 8:36 pace. My official pace was 8:39, so not that much different and still under 8:40. 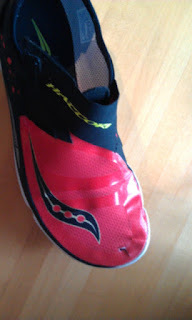 I think I ran it pretty hard, because after the race I noticed that my Hattori was ripping at the top. The first third of a mile took us along South Street and then right on Berry Hill Road where the street begins its uphill stretch. We continued up the aptly named Berry Hill for over a mile and I was able to gain some position. I passed a number of runners who were struggling with the elevation at that point. About halfway up this road I realized that I wasn't struggling with the hill at all. In fact, I was actually enjoying myself. I encountered the first mile split sign along Berry Hill Road, that read 9:08. I knew that I had another half mile before we turned on Sandy Hill Road that would take us back into town for the finish. I knew the steepest part of that road was still to come, so I prepared for it and tried to maintain this pace until I reached the top. When the turn came I was certainly relieved but still thinking that I was having fun. One of the spectators yelled "Hard part's over!" and I hoped that was true. We immediately went into a downhill charge that set the stage for the second half that was primarily downhill. I appreciated that but downhill running still takes a certain amount of work. But yes, it's much easier than running uphill! I came through mile 2 at 18:00 which meant that I made up time from my mile one pace. I hoped to continue that progress as we bombed along Sandy Hill Road, past houses with people cheering at the end of their driveways and a construction crew who were doing a big excavation. I wondered when we'd be making the turn onto Main Street and suddenly I noticed runners taking a sharp left that signaled that I was close. East Main had a short hill and on the way down I saw my parked car. That told me I was close to the finish line. Seconds later I saw the 3 mile split sign showing 26 minutes and I dropped down a gear for the last tenth of a mile. When I was within 100 feet of the line, a teenage boy tried to pass me on my right to beat me to the finish. I increased my pace and beat him over the line by a second. There was plenty of water, juice, electrolyte drink, bagels, cookies, energy bars, fruit and even gourmet cupcakes waiting for us at the end. I had water and some electrolyte drink but just about everyone else had a softball-sized cupcake in their hand. Nicely done, my complements to the race organizers. My family couldn't join me this morning because of activities related to my son's birthday but they were all excited to hear how things went when I called. Having parked on the road that led to the finish line, I needed to wait another 25 minutes for the last runners to finish before I could start heading home. It was fun to sit in my car and see these runners and walkers going by. It's hard work no matter when you finish and I admired the efforts of these people as much as those who crossed the line in less than 20 minutes. 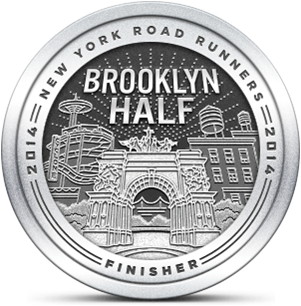 This was a great race and I look forward to running it again next year. Next on my schedule is the Run for the Warriors 10K in November followed the next weekend by the Long Beach 10K Turkey Trot. I'm going to try to do a December race this year, if schedules work during that busy month. Congrats on the great race, and you're right about fall races and fall running in general - I've been enjoying this so much it's hard to stop myself from going out there twice a day. Keep on truckin. Thanks Adam. I wish I had the time to run doubles. Nothing like the fall weather. Enjoy this now -- before we know it we'll be dealing with ice, snow and zero degree temps. Gal you beat that young kid.......There's one for us old guys. My neighbor & son ran the same race as he was proudly wearing his shirt on Sunday. Good to hear from you. I may have come in squarely mid-pack last Saturday but I couldn't let him get by me! That race sweatshirt was nice. So nice, my daughter took it and I haven't seen it since!